If the US is to be an effective ally of the democratic nations of Europe, it must see the European Union (EU) as it really is. In the years after the Second World War, the US was right to encourage Western Europe to trade more freely and to cooperate for their own security, both to defend against the Soviet threat and to stabilize the region’s fragile post-war democracies. This policy lost its relevance after the end of the Cold War and the rapid democratization of much of Eastern Europe. At that point, the US had achieved what it wanted to achieve with its support for a united and free Europe. But yet the US has continued to believe that its interests rest in promoting an ever-closer Union, one that has steadily impinged ever more deeply on the sovereignty of its democratic members. Particularly in light of the impending U.K. referendum on its membership of the EU, but also in light of Europe’s continued relative military and economic decline, the US must reassess its support for the EU. That reassessment should begin by understanding, and repudiating, the myths about the EU that now cloud American policy-making. Here are the top ten US myths about the EU. The founders of the EU, which had its origins in the European Coal and Steel Community in 1951, certainly wanted to make war between France and Germany impossible. But what actually prevented war in the decades after 1945 was West Germany’s acceptance that it had lost (and deserved to lose) the Second World War, the creation of the NATO alliance, and the suppression of Europe’s rivalries by the two super-powers, the US and the USSR. Today, there is no serious risk of war between any members of the EU. What guarantees that is not membership of the EU: it is the fact that all the EU’s members are democracies. If they were not, membership of the EU would not stop them from fighting. The single most common myth about the EU in the United States – heard occasionally in Europe too – is that it is 1776 all over again: the creation of a new federal union. This is a particularly potent and dangerous myth. The EU is not a federation, in which important powers are permanently retained by the states and only a defined and necessary set are delegated to the central government: it is a steadily-deeper union that seeks the progressive eradication of sovereign state powers. Moreover, the European peoples are not a political body, a demos: they speak different languages, have different cultures, and have different histories. Unlike the American people, they were not united by a shared struggle for independence, a freely-adopted constitution, a great civil war, and tremendous mobility between the states. If there is an analogy to the US in Europe, it is the Federal Republic of Germany, or the United Kingdom of Great Britain and Northern Ireland – not the European Union. The founders of the EU, like many Americans at the time, were naturally concerned that Europe might experience another of the descents into political madness that engulfed it in the 1930s. They rightly believed that prosperity born of economic cooperation could help prevent this. But today, the EU actually encourages extremism. From Greece’s Syriza to France’s National Front, all of Europe’s far-left and far-right movements have gathered strength precisely because of popular resentment of the EU’s stances on immigration and the Euro, in particular, and more broadly because of its assault on national sovereignty. The EU is fond of citing the enormous volume of law – the aquis communautaire – that nations are forced to adopt before they can join the Union. But at heart, the EU’s institutions are not law-bound: they are political, and their aim is always to advance the cause of ever-closer Union. For example, the EU’s Lisbon Treaty supposedly banned national bailouts, but in 2010, as then-French Economy Minister Christine Lagarde admitted, the EU “violated all the rules because we wanted to close ranks and really rescue the Euro zone.” The EU is not about law: it is about centralized power. The EU pretends that the US and the EU have a “transatlantic partnership.” Undoubtedly, US relations with the nations of Europe are vital. But the EU is not the nations of Europe. The EU’s assertion that a partnership exists reflects its desperate quest for significance, which it hopes to win by claiming it is important enough to be a partner – with the equality of status that implies – with the US Moreover, leading EU politicians often make their true feelings about the US clear: in 2012, for example, the then-chair of the EU-US inter-parliamentary group, a German conservative,accused “Anglo-Saxon interests” of fomenting the Euro crisis by launching an economic war against Europe. The EU sees itself a separate power with interests that sometimes coincide, and sometimes conflict, with those of the US But its core interest is in being, and being seen to be, separate – not being a partner or an ally. The EU pretends it “plays important roles in diplomacy, trade, development aid and work with global organisations.” It touts, for example, its “European Neighborhood Policy,” even though virtually the entire European neighborhood from Ukraine to Libya is now at war. But at heart, the EU is an inward-looking organization that is primarily concerned with elaborating its own institutions. It creates arguments about burden-sharing at home, not agreements to shoulder a burden abroad. It promotes not European globalism, but European disengagement. There’s no question that free trade in Europe has been an enormous boon to Europe and to the world. But the EU is not a free trade area: it is a managed market, many of whose members share a common currency. But as the Financial Times hasremarked, the Euro was “unnecessary for economic convergence, if not actively harmful.” Many of the Euro’s members did not meet the conditions for belonging to it. The pretense that they did, followed by the measures adopted to keep them in the currency union, has caused enormous suffering: Greece’s depression today, for example, is worse than the US Great Depression of the 1930s. The EU is not promoting prosperity: it is scrambling to keep up with the catastrophes that its own misguided policies are causing. The nations of Europe have substantially, and in many cases scandalously, reduced their defense spending since the end of the Cold War. The EU pretends that its Common Security and Defense Policy allows EU member states to “pool their resources and to build stronger defence capabilities to act rapidly and effectively.” That is a farce. The US security relationship with Europe runs through NATO: every pound or Euro that EU members invest in EU capabilities is one they cannot invest in NATO. EU pooling and sharing does not build transatlantic defense: it merely justifies further cuts on the grounds that pooling and sharing will make up the difference. 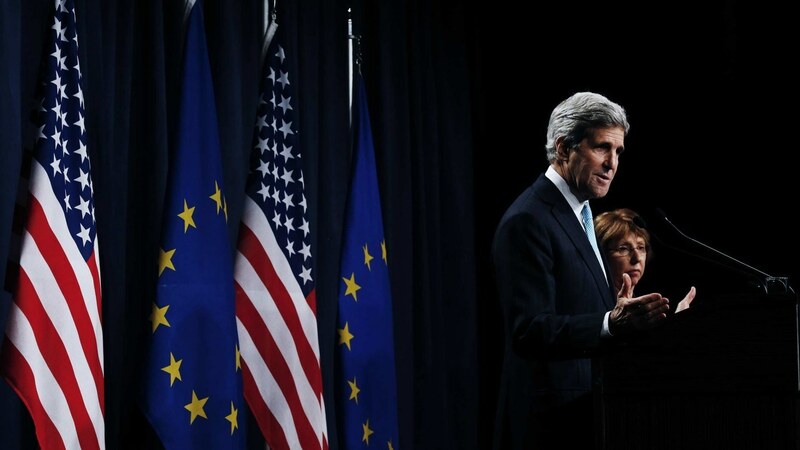 The TTIP agreement, as it is commonly known, is currently under negotiation. If it genuinely promotes economic freedom, it will be a modest positive. But at most, it will produce about $160 billion in gains, over fifteen years, for the entire EU. In 2014, the EU’s GDP was $18.5 trillion. In other words, TTIP will, at best, increase the size of the EU’s economy by less than one percent. That is not enough to rescue the Euro, restart Europe’s economic growth, save NATO, increase European defense spending, or achieve any of the other miraculous results that have been predicted. In 1946, Winston Churchill called for the “re-creation of the European family,” in order to restore the peace of “the origin of most of the culture, arts, philosophy and science both of ancient and modern times.” Churchill wanted Britain to support the European family, but not to be part of it politically. His vision was of a restored Europe that would serve again as the font of Western civilization. But the EU rejects Europe’s history as story of war, nationalism, and failure: Its Lisbon Treaty makes only the vaguest of references to Europe’s past and its civilization, regarding it not as the source of Europe’s greatness, but as a problem for the EU to overcome. Apart from saving the Euro, the EU’s latest fixation is promoting a common energy policy. If Europe had listened to Ronald Reagan when he warned in the early 1980s that relying on Russia for energy was dangerous, Europe’s energy situation would today be less insecure. And if a common energy policy meant more choice, competition, and a fully-connected grid, that would be sensible. But for the EU, the point of a common energy policy is that it allows Brussels to demand the harmonized control of yet another sector of the European economies. If European nations were serious about energy security, they would be promoting fracking and nuclear power, not running away from both of these domestic sources of energy as Germany and too many other continental nations are doing today. There must be a basic unity between the principles on which the US is founded and those of its diplomacy. The most important of those principles is that the US is a sovereign and independent nation: if the US is not free to make its own laws under the Constitution, it is not free at all. The essence of the EU, on the other hand, is that it is a supranational authority that has steadily imposed ever-tighter constraints on the free and democratic nations of Europe. If other peoples wish to vote away their right to rule themselves – even though that right, being inherent, is ultimately inalienable – that’s their business. But it is not something the US should support, because it is antithetical to the US’s most important beliefs. The EU is founded on a principle antithetical to that on which the United States is based. It’s certainly possible for the US to do business with the EU, but the relationship will never be one of true partnership because the parties to it are fundamentally different. And the US can do business with the EU effectively only if it sees the EU not as myth would have it, but as it stands in reality. As for Britain – it’s already less bound by the EU myths than any other member state. Too bad its freedom of mind isn’t accompanied by a similar freedom to govern itself. Ted R. Bromund, PhD, is Senior Research Fellow in Anglo–American Relations in the Margaret Thatcher Center for Freedom, of the Kathryn and Shelby Cullom Davis Institute for National Security and Foreign Policy, at The Heritage Foundation.